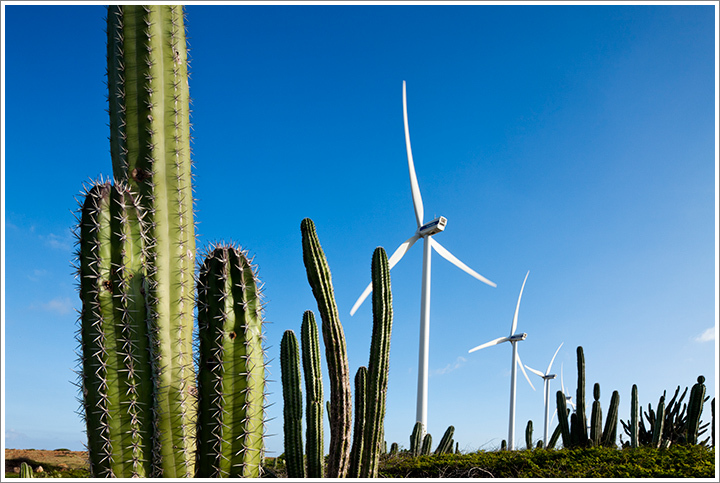 Wind turbines and cactus in Arikok National Wildlife Refuge at Windmolenpark Vader Piet. Photographed January 26, 2011 with a Canon EOS-1Ds III camera and 24mm f/3.5 Tilt-Shift Lens. Exposure 1/60 second at f/22. This entry was posted on Wednesday, January 26th, 2011 at 6:08 pm. It is filed under On the Road and tagged with Aruba, Caribbean, Travel. You can follow any responses to this entry through the RSS 2.0 feed.